Assess damages and needs for national or international support. Prepare reports for the relevant authorities and institutions. Advise decision-making groups on emergency and post-emergency matters. Establish actions for coordination with other agencies and civil society organizations that are working in the health sector. Establish contact and coordination with international groups or teams that provide emergency support. In general, a health response team should include the following members, though depending on nature of the disaster, other specialties can be included. 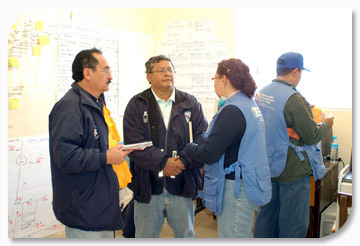 Coordinator: Organizes the team, prepares the action plan for damage and needs assessment, defines the team’s role, prepares reports, coordinates with other actors and agencies, requests and consolidates reports, advises on needs for international cooperation, and identifies needs for the reconstruction phase. Epidemiologist: Supports the creation and/or operation of the local epidemiological surveillance system, early warning systems, sentinel sites, investigations of outbreaks, development of surveys, and writing of reports. Health services specialist: Supports the assessment of structural and nonstructural safety and the functional capacity of health facilities, identifies and articulates immediate needs, prepares proposals for alternate medical care sites, and also proposals to improve the network of services. Sanitary engineer: Evaluates impact on basic water and sewerage services, formulates proposals for supply, provides advice on water quality control and environmental health in temporary shelters and camps, and recommends environmental sanitation measures. Mental health professional: Analyzes the impact on the population and on health workers, and suggests alternatives for implementing a local plan to give affected populations immediate support. Field administrator: Organizes the mobilization of personnel and the administrative and financial arrangements for field operations. Field logistics officer: Organizes transportation to the site of the disaster, accommodations for the team’s stay and its work site; installs equipment; and identifies needs for support. Communications person: Seeks and compiles relevant information on the situation and on actions of the health ministry, and provides support for the preparation of situation reports and their dissemination. The members of health response teams should be identified at the preparedness stage, should be ready for action in the field, and should be committed to deployment if assistance is required, whether in their own country or in other countries. They must be familiar with the damage and needs assessment process and mentioned above, as well as international standards for humanitarian assistance. In addition, they should be informed on international standards for donations in disasters. The recommendations on international humanitarian assistance are equally useful for both potential donors and to recipients of international aid. It reflects decades of experience in humanitarian assistance and provide the best possible information on what assistance is valued and what assistance can cause a second disaster.